Indian blanket (Gaillardia pulchella) is a short-lived annual flowering plant native to the central United States. It is easily grown throughout the southeast. 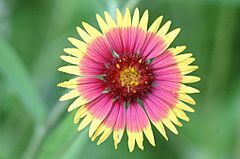 The flowers are bright red with a yellow rim and is slightly smaller than Gaillardia aristatabut is very drought tolerant and even salt tolerant, thriving along coastal dunes. The branching stem of Gaillardia pulchella is hairy and upright, growing to 60 cm (2 ft) tall. The leaves are alternate, mostly basal, 4–8 cm long, with edges smooth to coarsely toothed or lobed. The pinwheel, daisy-like inflorescences are 4–6 cm in diameter, vividly colored with red, orange and yellow. The central disc florets of the flower head tend to be more red-violet, with the outer ray florets being yellow. In one variety, almost the entire flower is red, with only the barest tips of the petals touched with yellow. It blooms practically year-round in some areas, but more typically in summer to early fall. The fruit is an achene. 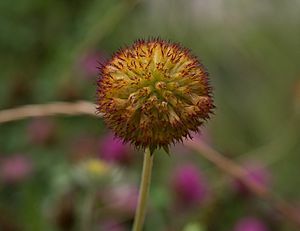 Gaillardia pulchella Facts for Kids. Kiddle Encyclopedia.